My favorite restaurant was Carmine's, a nice authentic Italian restaurant, which we have very few of in my town of Chapel Hill. Italian and nice yes, authentic no. Well maybe Carmine's was a little more than authentic but it was a great restaurant. If you like Italian food and you don't live in a town or city with a lot of Italians then it will probably be the best Italian food you have ever eaten. The portions are very large and the people who work there are very friendly. Go for the Steamed Mediterranean Mussels, the biggest mussels I have ever seen besides those awful green-lipped ones that come frozen from Australia. These were fresh mussels. I live in a state that is on the ocean and we don't get mussels this big. Afterwards we hung out with the manager and guess what. 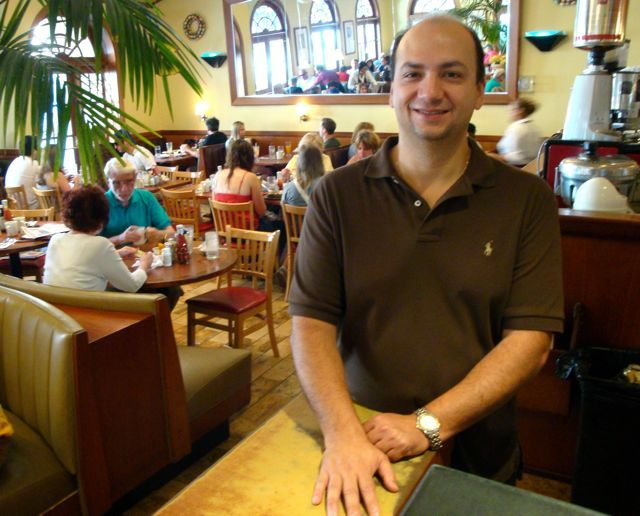 Carmine's is Greek, part of the the Rosebud chain or restaurants which began as a luncheonette owned by Alex Dana, the son of Italian and Greek immigrants, who still runs the restaurant group. 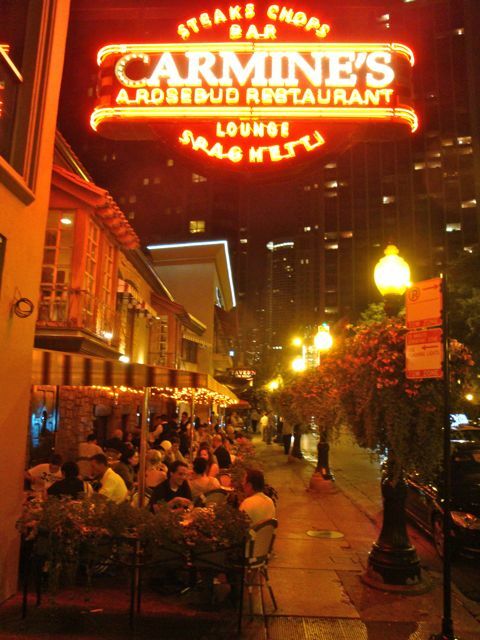 There are a number of Rosebuds and Carmine's scattered around Chicago and I am willing to bet that they are all well-run restaurants that are worth going to. You can visit their website or see their menu. They are located at 1043 North Rush Street (Tel: 312-988-7676) just a few blocks from the Ambassador East(Public) Hotel where I was staying. I would say put this restaurant at the top of your list. Another of my favorite places to eat was the Blue Agave at 1050 N. State street which was also a few blocks from my hotel. This was recommended to me by a friend who could not meet me for dinner and assumed I would be just as happy drinking frozen margarittas and eating nachos, which was absolutely true and is exactly what I did. The Blue Agave is listed as a 'tequila bar and restaurant' and though it has a fairly big choice of entrees, in my three visits there (in a week) I pretty much stuck to the appetisers and the tequila. Actually if you go to their website you would not even know it is a restaurant except that it has the word restaurant on the front page. But there is a tequila menu and no food menu. Well, if you drink enough tequila it does not really matter what you eat does it? I suppose if you want to lower your food costs you can focus on selling tequila and maybe that is their plan. Plus tequila does not go bad like beans, rice and chips can. So probably this is not where you want to go for your meal on your one big night out in Chicago, though it is a good place to start. And if you drink enough tequila you may not leave and if you do you may not care where or what you eat, which can save you money sometimes. The restaurant also features tequila tastings. 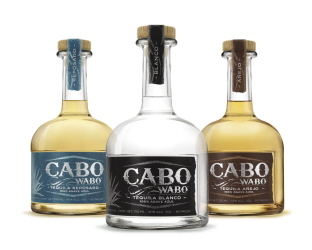 Try the Cabo Wabo which is my favorite. It was Sammy Hagar's company and his tequila is way better than his music. Obviously I can't call Blue Agave the Best Mexican restaurant in Chicago based on three visits where all I ate were nachos and margarittas. So if you are looking for good authentic Mexican food go to Fonda del Mar at 3749 W. Fullerton Ave, It's not in a trendy upscale lively neighborhood with lots to do but the food is amazing. It also is BYO. But if you bring a bottle of tequila, they have a fantastic homemade margarita mix that they will put your tequila in and bring a pitcher to your table, or pitchers as the case may be depending on how big your tequila bottle is and whether you are driving or taking public transportation. Try the grasshoppers just to say you did it. If you don't want to because you are afraid or it sounds disgusting drink more tequila and don't even think about it. Just do it. If you have eaten grasshoppers before and know you don't like them there are other things to eat. See their menu. I had never been to a Brazilian Steak House before. We have one in Durham but I was never so interested in steaks or Brazilians that I bothered to check it out, no offence to Brazilians or people who like steaks. 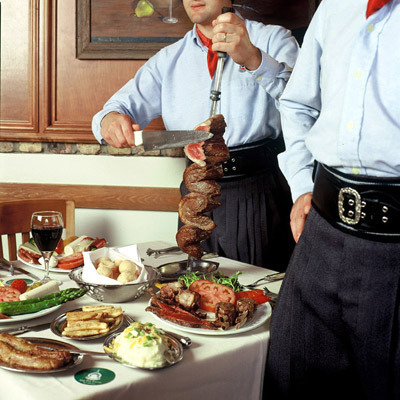 But a Chicago friend seemed shocked when I admitted I had never been to a Brazilian Steak house and recommended I go. I did. I went to Fogo de Chao at 661 N La Salle Street and ate more meat in one sitting than I have eaten in all the years I have visited my local Greek Festival combined. Here's how it works for those of you like me who don't know since one visit pretty much makes me an expert. You enter the restaurant and sit down as you would in any other restaurant and the first thing you notice is a lot of people from South America in Brazillain garb, gauchos I guess you would call them, carving off hunks of meat for each customer. So right away if you like meat you are happy with your surroundings and can hardly wait for them to come to your table. But that's not how it works. First they send you to this enormous appetiser and salad table which someone has gone through all the trouble of creating all the most delicious non-meat dishes you can imagine. So self-control is the name of the game because if you eat all the things you want on the buffet table that leaves less room for filet mignon, racks of lamb, and the 13 other types of meat that they bring you. 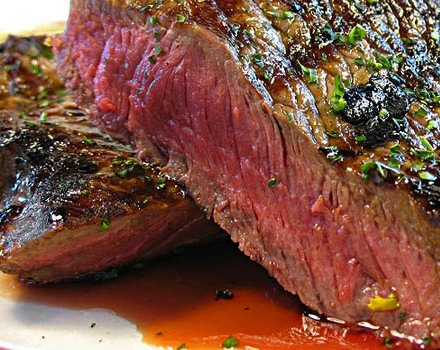 Their signature steak, Picanha is a prime cut of top sirloin, very popular in Southern Brazil. Beef ancho is cut from the prime part of the rib eye. The beautiful marbling on the rib eye provides its superb flavor, juiciness and texture. Alcatra is a special cut of top sirloin originating in the steakhouses of Southern Brazil. Need I go on? Now just let me tell you that in Greece they don't have a history of eating steak. So you go to a restaurant and you order what they call steak and you get a thin cut of overdone meat, usually tough. So after a summer in Greece the steaks at Fogo de Chao was like a gift from God. I would fly back to eat there again, despite the fact that I still not gone to the Brazilian steakhouse in Durham. They have a great wine list and at the end of the meal they do come by with deserts but by then you will probably be thinking to hell with that, I need to take a long walk and 500 mgs of Niacin so I don't have a cholesterol attack. Well, if this turns out to be your last meal on earth it is a good one. One day I woke up with a craving for Chinese food. But not your typical neighborhood Chinese food that you can find in any shopping center in the USA and not your upscale PF Chang variety either where you eat fancy versions of traditional dishes while you nurse a manhattan or a mohita. I wanted to go to a Chinese restaurant in Chinatown where Chinese people ate and the menus are in Chinese ansd there are specials on colorful paper splashed all over the walls written only in Chinese so that the people who don't read Chinese can't order them because the restaurant assumes they won't want to anyway. I wanted a restaurant with giant tanks of murky water full of fish and crabs and the kind of sea creatures that you look at and wonder what the heck is that thing. I wanted a Chinese restaurant that had ducks in the window looking like naked sunburned condemned men hanging from the scaffold in a Sergio Leone movie. I wanted a Chinese restaurant where the only art on the walls was an ad for a product that I had no idea what it was except a pretty Chinese girl was selling it. 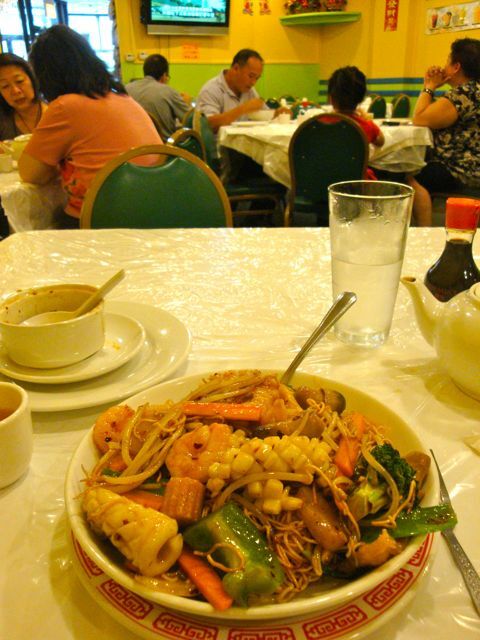 I wanted a Chinese restaurant where nobody spoke English, not even the western looking guy at the next table. I am assuming you get the idea by now. I walked every street in Chicago's Chinatown and almost every place was like this. (except the fancy places). Clearly this was not going to be a case of finding that one authentic Chinese restaurant, but having to choose the best out of dozens of authentic Chinese restaurants. Finally, I settled on the very last place on the edge of Chinatown, called Dragon Court, where I had one of the best things I have ever eaten at a Chinese restaurant, a fish low meinkind of dish which I had the presense of mind to photograph so people who read this page can bring the picture instead of trying to figure out what it was from the menu or from the pices of paper on the wall written only in Chinese. The restaurant is called Dragon Court and I would tell you the address except the business card I picked up from next to the cash register is all in Chinese. But there is a phone number on it so if you call 312 791 1882 you can get directions. If you understand Chinese. One day my friend called me up at the hotel. I want to take you to an amazing restaurant for lunch. I am not really a lunch person because I don't like to drink during the day and I find that eating lunch interferes with dinner, where it is ok to drink, since I like long dinners with wine and lots of conversation. You are going to eat a steak Jibarito my friend told me, at a Puerto Rican restaurant near Humbolt Park. Well that sounded lovely to me. A light Puero Rican meal and a walk in the park to work off the calories and be ready for dinner. OK. Let's do it. So my friend, let's call him Fred(not his real name) showed up at my hotel in his Honda Accord and off we went, me feeling very secure since both Andrea and I have Accords and they never break. This one did. But miraculously it made it all the way to Borinquen at 1720 N California Ave before it died in what we would call in the south 'a dangerous neighborhood'. (Maybe you know this expression). Well, we can deal with this later. Let's eat. According to Wikipedia who describe it way better than I could, a Steak Jibarito is a "specialty of Chicago, a sandwich made with flattened, fried green plantains instead of bread, garlic-flavored mayonnaise, and a filling that typically includes meat, cheese, lettuce and tomato. The original jibarito had a steak filling, and that remains the usual variety, but other ingredients, such as chicken and pork, are common. 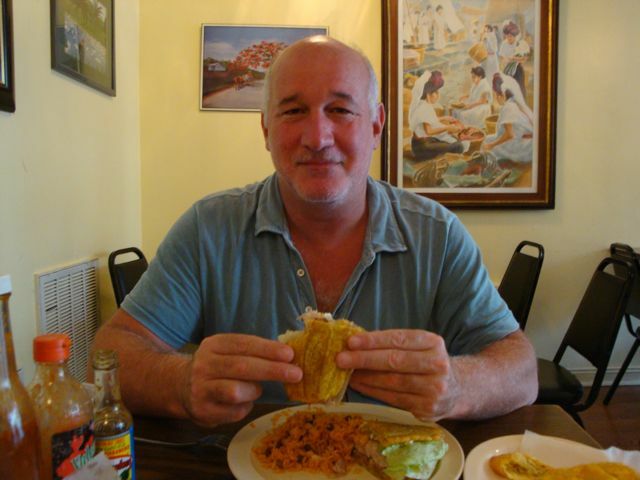 Chicago restaurateur Juan "Peter" Figueroa introduced the jibarito at Borinquen Restaurant, a Puerto Rican restaurant in the Humboldt Park neighborhood, in 1996, after reading about a Puerto Rican sandwich substituting plantains for bread. The sandwich's popularity soon spread to other Latin-American restaurants around Chicago, including Mexican, Cuban and Argentinian establishments, and jibaritos now can be found in some mainstream eateries as well." So there you have it. It was even invented by the guy whose restaurant we were at. And it was delcious as was everything we ate there, especially the hot sauce which I bought several bottles of and brought back to North Carolina. But as good as it was, it still could not fix our car. But the owner called a friend with a tow truck and he took it away and we wandered around Humbolt Park and then took a taxi back downtown. Well Borinquen does not have a website as far as I can tell but it has about two hundred reviews on yelp so don't be afraid to go there no matter what you have heard about Humbolt Park. But you may want to go in the daytime like we did, and in a car that won't break down. Chicagoans seem to want you to eat their hotdogs, convinced that Chicago hot dogs are the best in the world. Maybe it is one of those battles between Chicago and New York things. But I go to New York and nobody ever tells me I have to eat a hot dog. Like when I went to Wrigley Field to watch the Cubs play the Mets my friend said "YOU HAVE TO EAT A CHICAGO HOT DOG". Why? I asked. What is so special about a Chicago hot dog? "Because they make it a special way and there are specific condiments you have to put on and the order in which they are placed is very important. It is very important that when applying the toppings that you dress the dog and not the bun!! 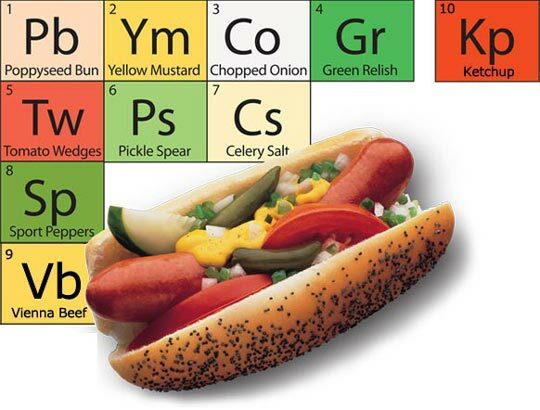 Also, most will argue that a Chicago Style Hot Dog is never boiled, but slowly simmered using steam heat. Char-grilled, however, has come to be acceptable. If you experience pale relish, boiled or grilled dogs, grilled onions, or the worst of all sins: KETSUP, you are dealing with an imposter." He then rushed off and went to the concession stand to find me a Chicago hot dog. When he came back it did not have half that stuff on it. "This is NOT a real Chicago hot dog" he said. "But eat it anyway. So where do you get a good Chicago hot dog? Well besides the guys outside Home Depot (Greeks most likely) try Superdawg at Milwaukee Avenue at Devon and Nagle which has been there since 1948. Kind of out of the way if you are a tourist but if you have a car you will be happy to know that it is a drive-in. Then there is Morrie O'Malley's. If you are a Sox fan instead of a long-suffering Cubs fan then you know that this is the place to stop for a quintisenntial Chicago dog. Morrie's is only open March through November which is just about the length of White Sox baseball season in a good year and a month longer than the Cubs. But Cub fans have Murphy's Red Hots, renowned for its culinary dedication to the Chicago Red Hot, an all beef natural casing VIENNA frank, steamed or char-broiled, served in a steamy poppy seed bun with your choice of condiments (see above for guidance). Murphy's Red Hots is at 1211 W. Belmont Ave. Thank's to Vienna for this excellent chart which clearly shows you in periodic fashion what a Chicago Hot Dog should look like. Except they included ketchup and even though it is obviously optional my friend freaked out for it being shown at all and claims that this invalidates all the information contained on this site. I prefer to think the Vienna Company took the high road and included ketchup because surely there must be some people in Chicago who like it on their hotdogs and why alienate them? Normally I would not use one of these popular iconic phrases but for Chicago I could not resist. The Union Stock Yard & Transit Co., or The Yards, was the meat packing district in Chicago from 1865 and made Chicago the center of the American meat packing industry for decades. So the city has a history of meat eating since you usually make the most of what is around you. Steakhouses like Gene and Georgettis, Gibsons, (known for big martinis, big steaks and big desserts), that are very old school Chicago still maintain that "feel" but if you prefer the neighborhood places that have evolved out of the old Chicago steakhouses there's a FANTASTIC little Argentinian steakhouse called Tango Sur and it is cheap- and very romantic where you can eat range grown fillet mignon, cooked on the grill then topped with a red onion wine sauce and served with spinach mashed potatoes or BIFE VESUVIO: grilled prime steak sliced and filled with spinach, mar del plata cheese and garlic in a white wine sauce, served with argentine style potatoes. And if someone in your party does not eat meat you can go for the chilean salmon, oven baked then saut�ed with mango juice on top, accompanied with mashed potatoes. I am sure I have your interest and there is lots more. Tango sur is at 3763 North Southport Avenue. For more info and yummy photos see their website. OK. I understand that maybe the fact that I had just come back from Greece and was not so interested in Greek food that I would run all over Chicago looking for the best Greek restaurants, might make some readers unhappy if they are on this page looking for good Greek restaurants in town. 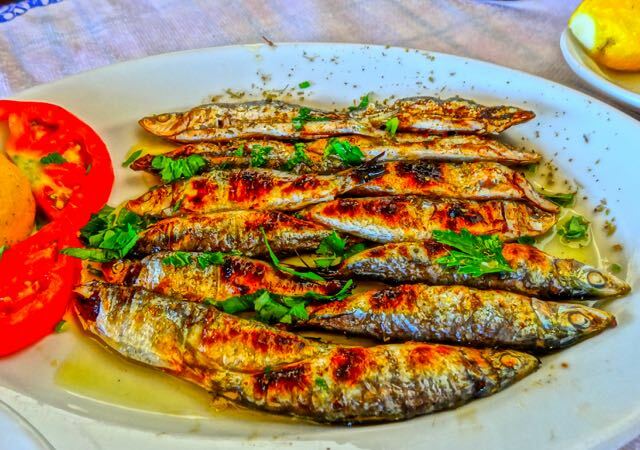 So if you can accept that I have not eaten in these restaurants and I strayed outside the confines of my own personal opinions and tastes and actually asked a friend to recommend the best Greek restaurants to me, then these are some that you are pretty much guaranteed to have a good meal at. Maybe not as good as you would have sitting in a taverna on a non-touristy Greek island, but good enough for the USA. I will refrain from giving colorful taste evoking descriptions since I have not eaten at any of them and instead defer to the webpages and menus of the restaurants. The first is the previously mentioned (somewhere) Mythos at 2030 West Montrose Avenue which passes for an authentic Greek taverna with flying colors according to Greeks who know what an authentic Greek taverna is. The same goes for Taxim at 1558 N. Milwaukee Ave. Kanela Breakfast Club brings a local, organic, and flavorful approach to a Greek-infused American breakfast and lunch. Everything is cooked from scratch and with local organic ingredients whenever possible. Another Greek-themed breakfast, lunch, brunch and dinner place is Meli Cafe with three locations in the city and a menu that looks like it was made in Greek diner heaven. The 9 Muses at 315 S Halsted in Greektown cooks everything to order using prime cut meats, pure virgin olive oil, Kalamata olives, fresh hand rubbed oregano, imported cheeses, and Mediterranean sea salt. Greek Islands at 200 S Halsted import their own extra virgin olive oil, wine, cheeses, seafood, olives, herbs and spices directly from Greece and lay claim to being the most popular Greek restaurant in the USA. Thank you to Venus Sky!